Opis: Orbiting closer to the Sun than planet Earth, bright Venus always appears to be near the Sun's position in our sky and often shines near the horizon in twilight hours. In fact, after posing as the brilliant evening star for the first half of this year, Venus has now swung around its orbit and is emerging in the predawn twilight as the morning star. Taken during its stint as the evening star, this imaginative long-exposure photo, of Venus and a 2-day-old crescent Moon gives the illusion of the pair "falling out" of the western sky. 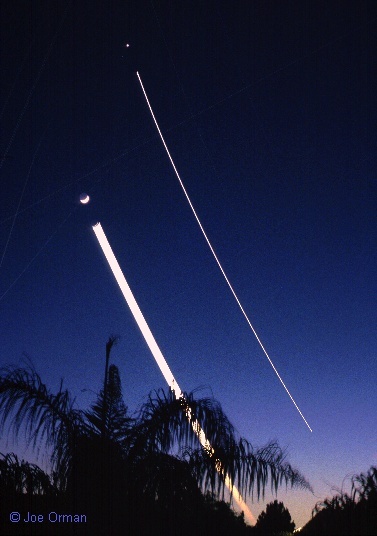 After an initial short exposure captured the Moon and Venus, the lens was covered for a few minutes, then left uncovered to record the trails until the Moon had set.